Singapore – July 22nd, 2013. 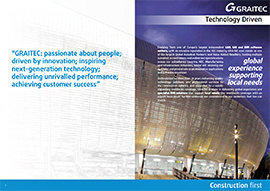 The GRAITEC Advance suite team is pleased to announce that they will be exhibiting at BuildTechAsia, International Building Technology Expo at Singapore EXPO on July 31-August 2, 2013. The GRAITEC Team will be demonstrating Advance Steel 2013, the powerful and user-friendly 3D structural steel detailing and fabrication software that automatically creates drawings, BOMs and NC files, and that communicates with Autodesk® Revit® among other systems. GRAITEC will also be offering free Product Presentation on Day 2, Thursday August 1st at 12:00-12:20 in the Yellow Zone. Come see us at booth #P07, in the IT Pavilion. GRAITEC, a leading worldwide software developer for CAD and structural analysis solutions has signed a new business partnership withVR CAM Technologies Sdn Bhd, a company located in Kuala Lumpur, Malaysia. The cooperation agreement signed between the two companies entitles VR CAM Technologies to promote, sell and support GRAITEC’s 3D BIM Steel Detailing Software, Advance Steel, in Malaysia. Changing demographics such as an annual population growth of about two percent, migration and socio-economic growth are resulting in the building construction market expansion, as these changing demographics increase demand for new buildings and refurbishment of existing ones. In Malaysia, construction of non-residential and residential buildings contributed between 40 to 55 percent of the total construction market between 2006 and 2009. The market revenues for building construction reached approximately $7.21 billion in 2008 and $6.67 billion in 2009, and it will potentially hit the $9.00 billion mark by 2015. (Source: Asia Pacific Environmental & Building Technologies Practice, Frost & Sullivan). VR CAM Technologies Sdn Bhd is a solution provider for the Civil and Structural engineering disciplines, with focus on structural analysis and design for steel concrete and post-tensioned structures. Since 1996 VR CAM Technologies has grown from strength to strength and is now a formidable organization where the key focus in meeting client interest and offering professional training services is the core ideal. VR CAM Technologies service the Education, Government, Construction, Power and Oil and Gas Industries, with main focus being on Malaysia and minor focus on South East Asia. VR CAM Technologies’ engineers and specialists have experience in structural design for steel and concrete, including post-tensioned/pre-stressed Building and Bridge structures. Their engineers and specialist consultants have up to 15 years design experience and when it comes to training, they provide their clients with training on best practices and on the efficient use of the software they distribute. GRAITEC, a leading software developer for CAD and structural analysis solutions, is supporting FORUM 8, its Value Added Reseller operating in Japan, by providing free Advance Steel and Advance Concrete licenses to the participants of FORUM 8’s 3rdStudent BIM and VR Contest open to students worldwide. The theme of this year’s contest is “Sustainable Station Front in Global Metropolis“. The 2013 VDWC challenges students to devise a proposal of a new environmentally friendly urban space, which will most likely become one of Tokyo’s significant stopping off points for people transferring from one transport mode to another, which radiates from a new train station in Tokyo’s harbor district. 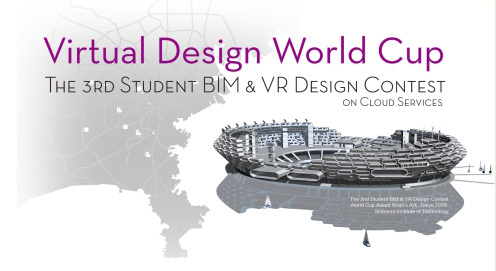 This is a contest open to students worldwide in which they compete amongst each other in designing their original model using BIM and Virtual Reality (VR) software for their chance to win a grand prize. Work by each and every contestant will be uploaded on FORUM8’s cloud server, VR-Cloud® server, to be judged on its logistics, technical and design aspect, as well as its creativity, architectural aspect, and how innovative and environmentally friendly it is. They will be using Forum 8’s in-house developed software UC-win/Road, 3D interactive visualization tool, as a mandatory software and their choice of at least one other software to help them design and model cities. GRAITEC will provide free Advance Steel/Concrete licenses to all students taking part in this competition. UC-win/Road, also known as VR-Design Studio, is the latest Japanese 3D Visual Interactive Visualization Technology for improved urban, transport, emergency & security planning, drive simulation, public consultation and human factors research and is ideal for visualizing BIM and VR models that portray various civil works. The Award for the winner is a grand prize worth approximately US$3,000 including World cup Trophy and award certificates. Twenty-two other lucky winners will receive other prizes and every contestant will of course win a participation reward for their work. Applicants have until September 30th to register online. Once they have registered and created their VR model, they will need to submit their work including scripts during the period from October 1st to October 10th, and once they have submitted their work, they will be notified of the webpage on FORUM8’s VR-Cloud(R) server to which they can access to browse and test their submitted model, along with their login ID and password. FORUM 8 and special guest judges will come to a decision and determine the winners on November 21st and the best works will be awarded at the Awards Ceremony. This contest provides a great opportunity for students to get a hands-on experience with FORUM8’s UC-win/Road as well as Advance Steel/Concrete/Design to learn all the great features and technology they have to offer. If you are a student due to graduate in 2013 or later go to this webpage and register today! For more information on the contest please click here. FORUM8, the Japanese 3D software specialist, produces state-of-the-art 3D VR and engineering software, in particular VR, FEM, Web, CAD solutions and services. Founded in 1987, FORUM8 is at the forefront of 3D Visual Interactive Simulation (3D VIS) technology and provides 3D VIS capabilities to specialists from various professions, including transportation, engineering, planning, emergency training, architecture, road safety and many more. The company’s premier product UC-win/Road is simply the best tool with the utmost 3D VIS capabilities that allows you to model your own 3D environment in which a highly accurate real-time simulation can be run quickly and easily. UC-win/Road interactive 3D environments can also be controlled remotely using FORUM8’s state-of-the-art cloud computing technology VR-Cloud® that enables the 3D environments to be broadcast over the cloud and accessed and interacted with by anyone with a PC or Android system anywhere at any time, thanks to VR-Cloud®’s underlying technology, the a3S cloud system, which allows data to be transmitted between client and server very quickly. FORUM8 obtained a patent for VR-Cloud®, defined as “Driving simulation equipment, server and program” that enables ‘driving simulation within the 3D VR environment using a computer keyboard’ from the Japanese patent office [Patent No. 5149426]. VR-Cloud(R) is by far the best solution for winning tenders or exploring alternative options in any kind of civil design project. GRAITEC has signed a new business partnership with novaCITYNETS Pte Ltd, a company located in Singapore. The cooperation agreement signed between the two companies entitles novaCITYNETS Pte Ltd to promote, sell and support GRAITEC’s 3D BIM Steel Detailing Software, Advance Steel, in Singapore. Singapore is a gateway to key markets in Asia. From commercial to residential, new development to upgrade, retrofits to restorations, Asia is the engine of growth. The Singapore construction sector has enjoyed robust growth with building contracts worth S$25.7 billion, representing an annual increase of 14% in recent years. To further propel this growth, the Singapore Government and the Building & Construction Authority (BCA) have been steering the construction industry to achieve higher productivity through the buildable design legislation. This has gained great momentum with the introduction of the S$250 million Construction Productivity and Capability Fund (CPCF). Funds from the CPCF are allocated to firms seeking to improve productivity through technology adoption, re-engineering. We are beginning to see builders adopting productive technologies like construction IT and Building Information Model (BIM); such as the ones provided by GRAITEC. novaCITYNETS began as a pioneer in developing and implementing specialized building and construction solutions, consultation services to various government and private sectors locally and overseas. In 2007 with the rise in Building Information Modeling (BIM), novaCITYNETS started a business unit, novaBIM to embarked on a fully focused BIM solution where BIM consultation and implementations are tailored and customized to the individual company’s needs, thus, assisting numerous companies with ground zero knowledge to be BIM ready for future projects. Today, novaBIM is the leading solutions and service provider of design and technology for the Architecture, Engineering and Construction (AEC) industry, with works spanning across many notable and iconic developments both locally and regionally including Reflection in Keppel Bay, Garden by the Bay, Tanjong Pagar Tower, V in Shenton, Bedok Residence, The River in Bangkok, Al Najaf in Iraq (400 Bed Educational Hospital in Iraq), Al Ain Hospital in Abu Dahbi and Anglier Hydroelectric Dam in Canada. Currently with offices in Singapore, Malaysia, Taiwan and Philippines, our staffs from both architecture and engineering background bring about invaluable knowledge to the field. The choice of a promising partnership between GRAITEC and novaCITYNETS in Singapore has clearly been driven by the aforementioned market opportunities and mutual fields of complementary skills and expertise. novaCITYNETS Pte Ltd is the leading Solution and Service Provider of Design Technology for Building & Construction industry in Asia. For the past 20 years, novaCITYNETS has been partnering with some of world renowned AEC application software developer and involved in numerous prestigious projects with its solutions and services. NovaCITYNETS, a member of BuildingSMART Alliance Singapore Chapter, is actively promoting Building Information Modeling (BIM) and Industry Foundation Classes (IFC) for the benefit of AEC/FM industry to improve the communication, productivity, delivery time, cost, and quality throughout the design, construction, operation and maintenance life cycle of buildings. GRAITEC will exhibit at BACE EXPO (Building Architectural Construction And Engineering) Trade Show in Kochi, India on 24-26 May: http://www.biztradeshows.com/bace-kochi/. Come and visit us at Booth No 5. GRAITEC will exhibit at India Warehousing Show 2013 in New Delhi, India on 02-04 May: http://indiawarehousingshow.com/. Visit us a Booth No D 41 A.
AppliCAD, GRAITEC’s Business Partner in Thailand, will exhibit at ARCHITECT EXPO Bangkok 2013, Thailand on April 30- May 5: http://www.architectexpo.com/. Please visit us at Booth No 5. Advance Steel® is specifically designed for steel professionals who require easy-to-use BIM structural steel software for automating drawing creation, documentation and fabrication.